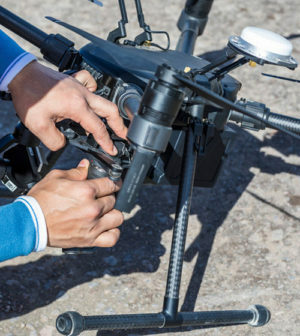 From Government Technology: As restrictions on flying drones have eased in recent years, their use by businesses has expanded. And expect to see that trend continue — the Federal Aviation Administration predicts the number of commercial drones will grow to 451,800 in 2022 from 110,604 last year, with remote pilots increasing to 301,000 from 73,673 in that same time span. Engineering firms are among those who say the pilotless aircraft systems have helped them in their work, and representatives from several area companies were among the attendees Wednesday (Sept. 26) at the first of three panel discussions hosted by St. Louis Downtown Airport and Bi-State Development to explore how the St. Louis region is approaching drone use. Srikanth Gururajan, a panelist who is an assistant professor at Parks College at St. Louis University in the aerospace and mechanical engineering department, said drones could be compared to a Chevy S-10 pickup. “It’s a tool to go do something you need to get done,” he said. The FAA had required companies that wanted to use drones to seek permission from the agency until 2016, when it allowed people to get licenses to fly the devices below 400 feet, among other rules. “That has opened the field tremendously,” said Lyle Hardin, manager of design technologies at CDG Engineers in St. Louis. And beginning this year, drone operators can apply to receive a near real-time authorization for operations under 400 feet in controlled airspace around airports through the FAA’s “low altitude authorization and notification capability” program known as LAANC. Hardin said the authorization was much faster and simpler than the former process.